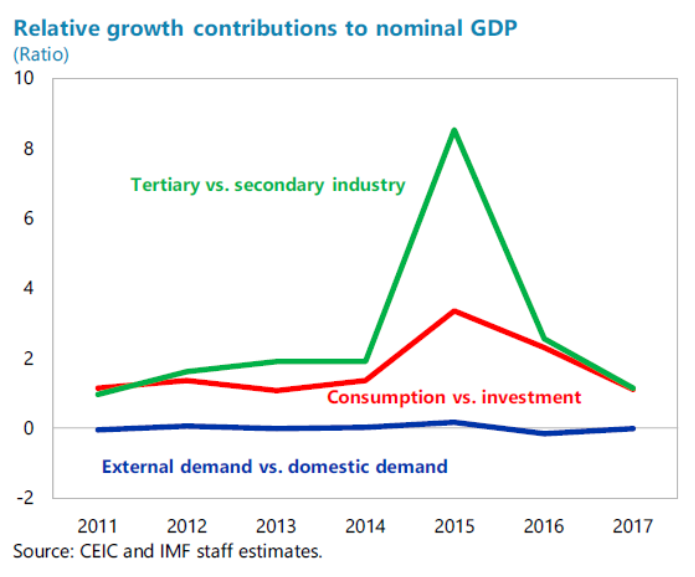 While China’s growth gathered momentum in 2017, rebalancing was uneven and decelerated along many dimensions reflecting the temporary factors behind the growth pickup. Going forward, rebalancing is expected to proceed as these temporary factors recede, but elevated income inequality and leverage will remain a challenge. The authorities are already pursuing several pro-rebalancing policies which could be expanded to support each dimension of rebalancing while reducing trade-offs between them. 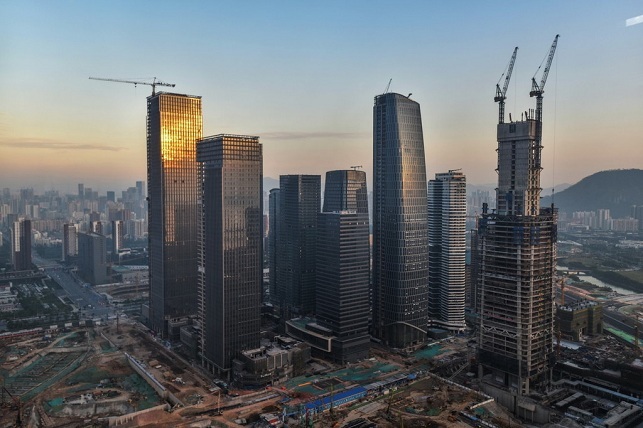 China has achieved remarkable economic growth over the past two decades. However, this rapid growth relied heavily on external demand and investment at the expense of greater equality and the environment. Excessive investment and resource misallocation lowered economic efficiency while debt accumulated. Meanwhile, income inequality and pollution worsened significantly. To avoid falling into stagnation, China has been striving to rebalance. Each axis in the spider chart represents one subdimension of the rebalancing framework. Overall, rebalancing progressed more in 2016. In 2017, rebalancing progress slowed except for the credit sector. Economic and social rebalancing is a major priority of the Chinese authorities, viewed as necessary to achieving their long-term development goals. Services, consumption are to become the main drivers of growth away from the past reliance on industry, investment and external demand. Mano and Zhang (2018) use a 4-dimensional framework introduced in Zhang (2016) to assess rebalancing progress in 2017. 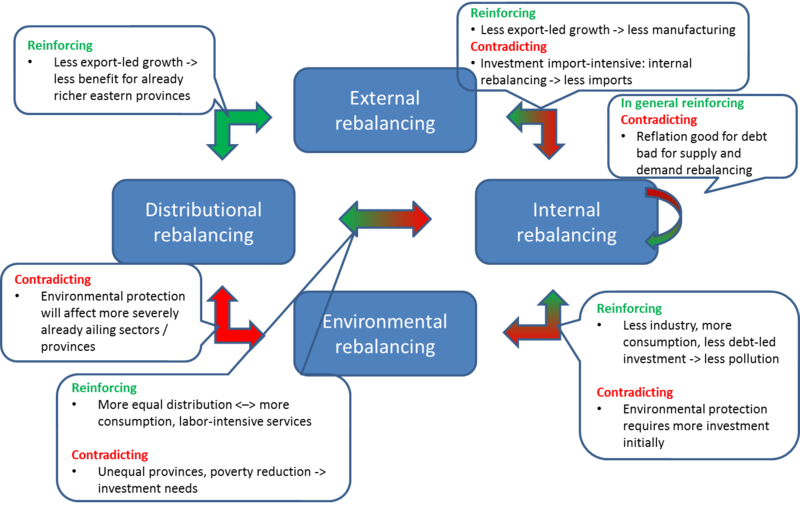 The four dimensions of rebalancing consider are: (i) external (external to domestic demand); (ii) internal (investment to consumption, industry to services, and less credit-intensive growth); (iii) environmental (reducing pollution); and (iv) distributional (reducing inequality). Each dimension in turn includes a set of summary indicators. 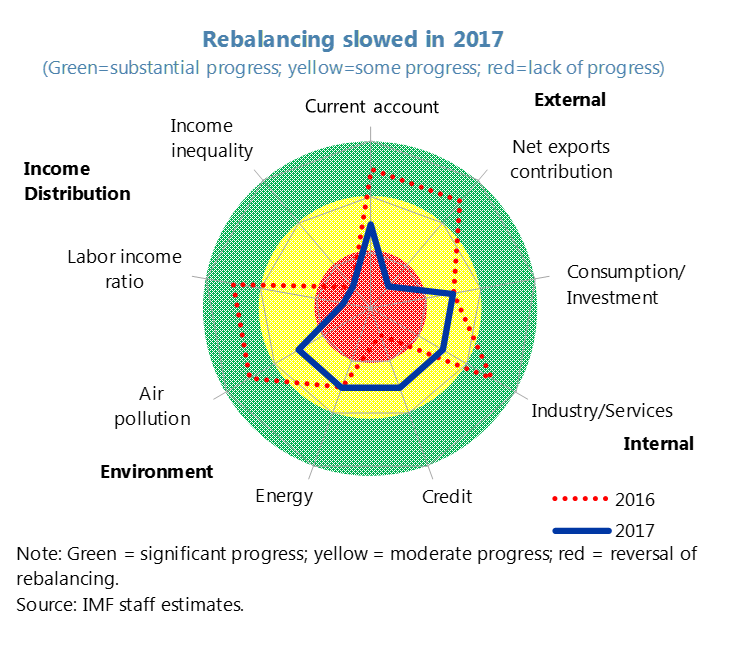 Using this framework, China’s rebalancing progressed unevenly in 2017. • External Rebalancing took a step back. External demand contributed strongly to real GDP growth in 2017 despite the decline in the current account (CA) surplus. The latter happened because the decline in the nominal trade balance was more than fully attributable to RMB-denominated terms-of-trade (ToT). In other words, the CA would have risen on real trade alone. • Internal rebalancing saw mixed progress. Although some variables in real terms showed progress, rebalancing slowed in nominal terms because of the strong rebound in the producer price index (PPI). An overall rebound in Chinese aggregate demand and global trade, as well as capacity cuts in steel and coal, all played a role (see Chen and others, 2018). This PPI rebound led to a sharp increase in the price of investment goods in 2017 while the consumer price index remained subdued, which depressed nominal consumption growth. On the supply-side, the PPI reflation boosted industrial prices (growing at 6.3 percent), while services inflation grew much less (at 3.2 percent). • Environmental rebalancing progressed. President Xi, in his address to the 19th Party Congress, said tackling pollution was one of the "three critical battles" for the next three years. Administration actions rolled out in 2017 effectively lowered air pollution and reduced electricity usage. However, market-based measures will likely be needed to sustain improvements. Going forward, the focus on more systematic approaches already being considered or implemented, such as a carbon or coal tax and an environment protection tax, could help sustain the improvement. PM2.5 of 74 cities in the winter of 2017 is plotted against that of 2016. 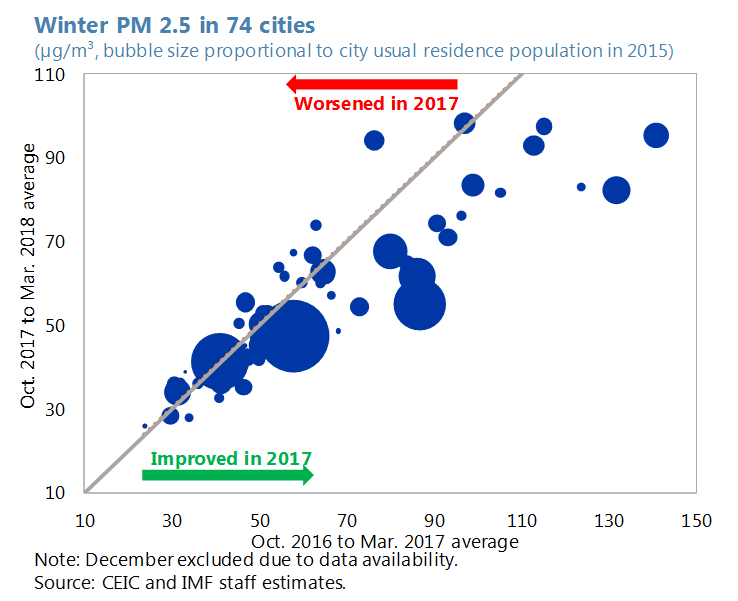 Due to the government’s effort to switch from coal to gas heating, most cities’ PM2.5 improved, especially the big cities (bubble size proportional to residence population). • Distributional rebalancing took a step back. Although China has achieved remarkable progress in poverty reduction, inequality remains stubbornly elevated and earlier success has stalled recently. China’s Gini index remains high and increased marginally in 2017 to 0.467. Median disposable income, which had grown above mean disposable income, grew comparatively less in 2017. Moreover, spatial inequality increased. Several regions with lower-than-average GDP per capita were further left behind in 2017, most notably in the northeast (Liaoning, Jilin, and Heilongjiang), but also in the west (Qinghai, Gansu, and Ningxia) and Hainan. On the other hand, richest coastal provinces and the municipalities of Beijing and Chongqing overperformed. The PPI reflation in 2017 supported the growth of several lagging provinces, and yet many could not converge to the national average (only Hebei, Henan, Xinjiang, and Shanxi exited the group of provinces struggling to converge). Diverging provinces reside in quadrant I or III. 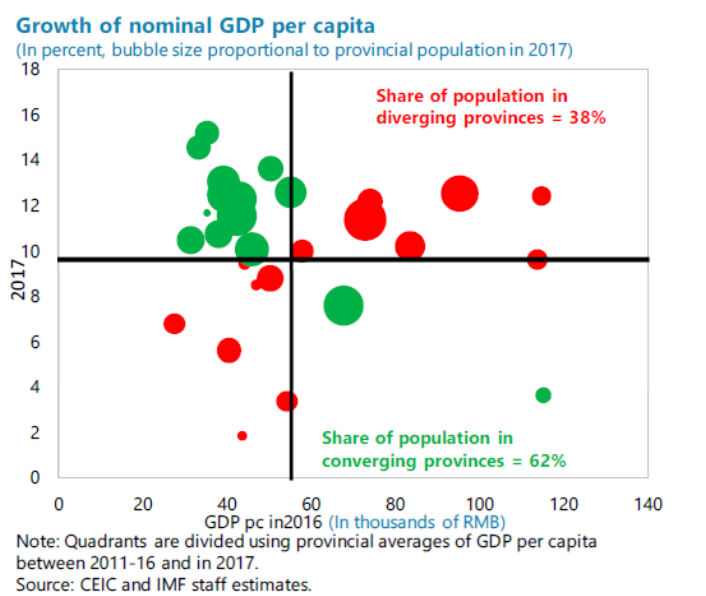 They are either poor provinces whose per capita GDP level was below the national average in 2016 and grew slower than the provincial average in 2017, or rich provinces whose per capita GDP was above average in 2016 and outperformed the national average in 2017. In general, rebalancing dimensions reinforce each other. However, there are also trade-offs. Lowering import-intensive investment could widen the external imbalance. Reflation of PPI may facilitate deleveraging but worsen other dimensions of internal rebalancing, as in 2017. Environmental protection and reducing inequality may require initial investments and slow internal rebalancing. Environmental protection may affect already-struggling regions disproportionately, given their industrial focus. The authorities see rebalancing as a major goal and have aligned their economic targets accordingly. Several rebalancing-enhancing policies are already being implemented. 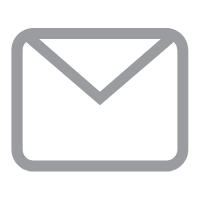 Notable examples include opening sectors to foreign investment, strengthening social safety nets by, for example, increasing budget support for health care, instituting and enforcing heavier penalties on pollution, and supporting the poor through direct transfers. 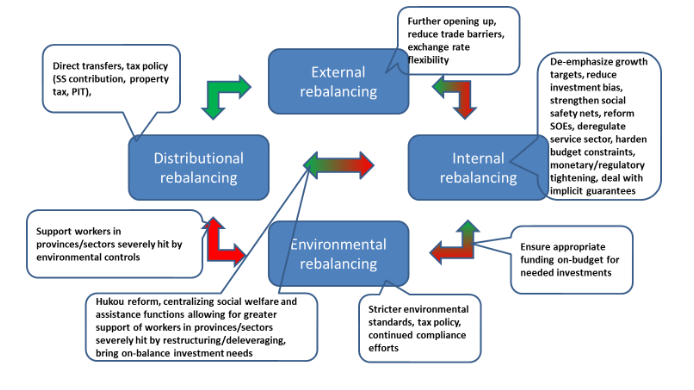 Most policies target individual dimensions of rebalancing but have positive synergies with other dimensions. • Distributional rebalancing: reform intergovernmental relations that will increase the resources available to local governments and strengthen equalizing transfers across regions, implement tax policy that reduces income inequality, including making social security contributions more progressive while broadening income tax payments and instituting wealth taxes like a recurrent property tax, boost expenditures that target inequality, including direct transfers to the poor and rural investments.  • Environmental-Distributional trade-off: centralize social welfare and assistance functions allowing for greater support of workers in provinces/sectors most affected by environmental controls. This article is based on Mano, R. C., and J. Zhang, 2018, “China’s Rebalancing: Recent Progress, Prospects and Policies,” IMF Working Paper, 18/243.